A member of the Ericaceae or heath family, the huckleberry plant produces a deep blue berry that has a more complex and acidic flavor than the blueberry. Huckleberry plants are native to North America and were once widespread berry plants, though they are much rarer today. There are four main varieties of huckleberry plants, but all share common characteristics. The four types of huckleberry vary greatly in size. On the small end, box huckleberry plants are low and bushy and top out at 20 inches in height. On the large end, tall huckleberry plants can grow 6 feet tall. Dwarf huckleberries and black huckleberries grow to 20 inches and 3 feet, respectively. All huckleberry plants have flowers that give way to fruit. The bell-shaped flowers have five petals and measure 1/4 inch long. Black huckleberry plants have reddish flowers, while box, dwarf and tall huckleberry plants have whitish-pink or pink flowers. Huckleberries resemble small blueberries in shape and color. The tiny dark blue orbs often have small stems on one end, since the tiny stems are hard to remove. Huckleberries have small sees inside. Tall huckleberries bear fruit from June to September; all other varieties fruit in May and June. Once widespread in North America, huckleberries today have a small geographic range. 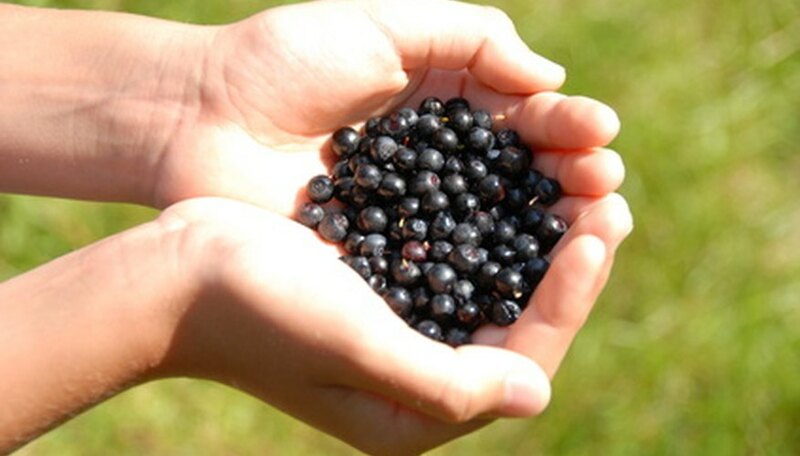 Black huckleberries are found throughout the eastern United States and Canada, notes the United States Department of Agriculture. Box huckleberry is only concentrated in the mid-Atlantic states, from Tennessee north to New Jersey. Dwarf huckleberry grows up and down the eastern United States and Canada, and tall huckleberry grows in the southeastern United States. Huckleberry plants have elongated ovoid leaves that are spring green in color. The twigs range from brown to red in color and are often coated in a fine hair.